From time to time, big names of haute couture go crazy on pearls. We have collected few most prominent examples for pearl fashion for you to enjoy and comment on! Princess Diana loved her pearls and she wore them very often. 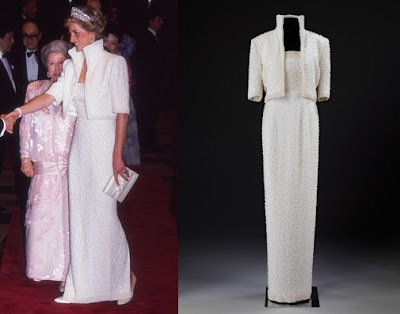 Known for her great sense of humor, Diana named one of her favorite gowns, encrusted with pearls, the "Elvis dress" because of its rich adornment and a high collar. The dress has been made by Catherine Walker in 1989 for Diana to wear during an unofficial visit to Hong Kong. Nowadays, the dress can be admired in Victoria and Albert Museum, London. 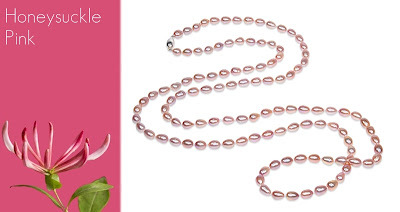 Pearls has been recognized as one of the most beautiful jewels in the world. Shimmery and lavish, they provide also a great inspiration to stage costume designers. We found two beautiful examples of pearl-themed attires that are just perfect for the silver screen shows. The designer calls himself the creator of jewel gowns. His stunning dress made entirely of pearls is a wonderful example of a stage costume that greatly underlines feminine beauty. It reminds me of Josephine Baker's costumes from the early 20th century. Made by Michael Kaplan for Christina Aguilera for her Burlesque role, this piece embodies the true spirit of a musical theater. The pearls shimmer with every move and introduce even more feminine opulence to Christina's stage look. It looks like stripes will stay with us for longer than one season. This spring they are getting bolder and more pronounced than ever. Body-hugging dresses, tops, and sweaters became our fashion staples for the warm and sunny months. 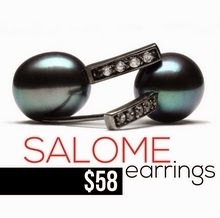 Pearl studs are a perfect accessory to underscore the nautical styles. Check out our two propositions for simple studs and a more daring starfish stud alternative!